Munich is one of the strongest technology locations in Europe. The Faculty of Business Administration follows the needs of companies to qualify more graduates with high technology and digitisation affinity: especially the "digital corporate worlds" become one of the biggest challenges faced by companies. Therefore, the Bavarian State, the Federal Government and the European Union have tackled strong initiatives on digitisation of economy and society. 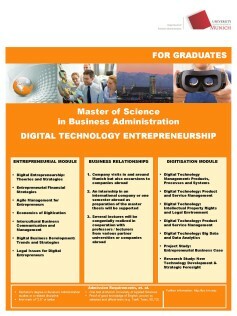 Master graduates of this master’s degree course should be able to utilise the key element digitisation within companies, but also as a competitiveness driver for the companies. 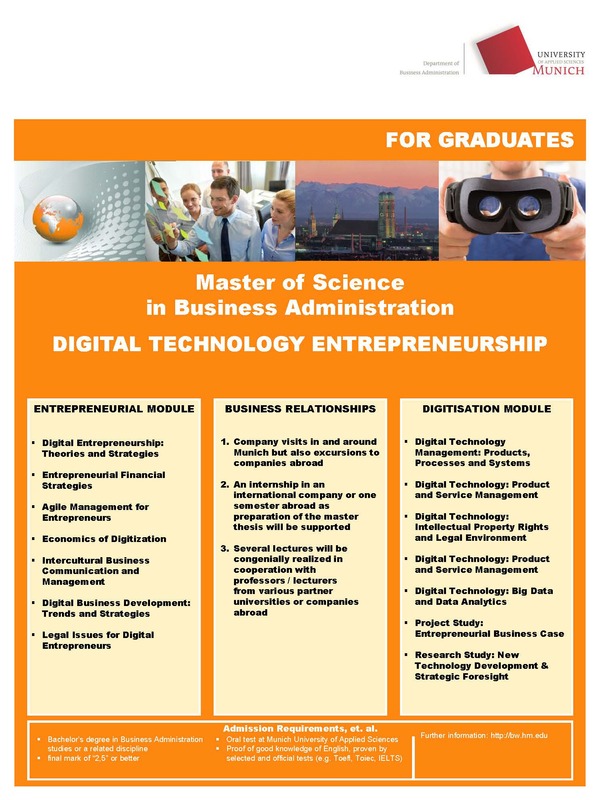 The new master’s degree course “Digital Technology Entrepreneurship” within the current and well-established Master of Science program in Business Administration is a profile shaping course for applicants with the focus on entrepreneurship and technology development – key area digitisation. The new master’s degree course should build “digital competences as key qualification for the economy” to enhance the entrepreneurial culture of companies. This includes the transfer of expertise for basic digital economic principles as well as digital business principles and strategies. At the same time the gap between management and technology expertise must be closed.